The DHX Experience is primarily aimed at developing skills and talent across the CFC’s core training programs, but also extends its offerings to help develop British Columbia-based acting talent through voice for animation workshops and a kids/tween/family showrunner bootcamp. Are you a CFC alumni who writes? Do you want to break into animated comedy television? The Canadian Film Centre and DHX Media are proud to present the Writing for Animation Bootcamp, a day-long workshop for 25 alumni. Led by StephanieBetts, SVP, Development and Current Series at DHX Media, and Cloudy with a Chance of Meatballs co-executive producers, Mark Evestaff and Alex Galatis, the workshop will look at the nuts and bolts of animation, the pitching process, as well as what makes up an animated writers' room, and the ins and outs of production. Participants will also partake in a case study on Cloudy with a Chance of Meatballs, and are required to read a script in advance. As a group, writers will watch the episode in class, examine the idea and deconstruct the elements that contribute to making this show a successful animation series. 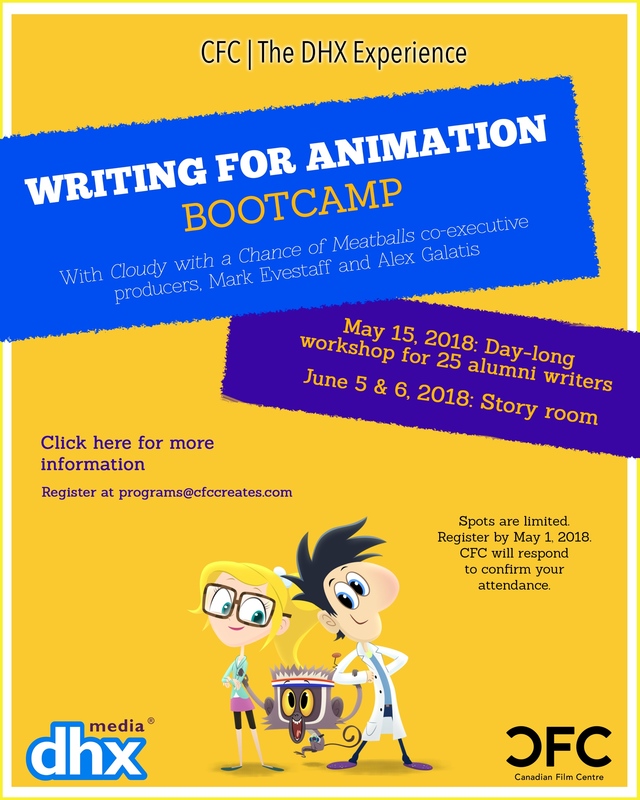 Using the tools they acquired in the workshop, the 25 participants will be invited to submit 2 episode premise pitches for the series for a chance to participate in a mock-animated story room on June 5th & 6th, 2018 with Mark and Alex. Only 6 writers have a chance to participate in the story room, and will be asked to prep several new ideas to pitch for the first day in the room. Mark and Alex will lead a roundtable to discuss each pitch premise and select the top ideas to move forward with. Writers will be assigned outlines to turnaround overnight in order to be further workshopped the next day. Writers will gain a better understanding of creative and practical aspects of writing for an animated comedy/adventure series, and can walk away with a sample 1-2 page pitch that could be optioned by DHX Media. Writers will learn what it means to work in an animated story room, and have a chance to impress two top showrunners. Please register by emailing programs@cfccreates.com by 5pm on April 30th, 2018.